What Was in the Equifax Leak? It's not pretty. Names, addresses, Social Security Numbers, birth dates, and in some cases driver’s license data were leaked. Additionally, the credit card numbers of 209,000 U.S. citizens, and credit-related dispute documents with personal identifying information for approximately 182,000 more U.S. citizens were leaked. Last year, Yahoo announced over a billion customer accounts were compromised by hackers, but Yahoo doesn’t have so much sensitive data about its users. This breach is a very big deal. That it happened is an outrage that’s getting worse every day, as we learn more. First, we learned that Equifax knew about the breach as early as July 29, but waited forty-one days to alert the public. Why did Equifax wait so long to alert the public? The company has not bothered to explain. Nor has it revealed whether card PINs were compromised. It seems such information is none the victims’ business. Next, we learned that three Equifax executives sold $1.8 million of their personal shares in the company a few days after the breach was discovered and a full month before it was revealed to the public. An Equifax spokesperson claimed that none of the execs knew of the breach at the time they sold their stock, a claim that will surely be examined closely by the SEC. Consumers who went to an Equifax website set up to tell them whether they were affected by the leak were initially required to agree to binding arbitration of any dispute arising from this matter. Equifax, in effect, said to the whole world, “We’re not going to tell you whether we lost your personal financial data unless you agree not to sue us!” That plan went down in flames; within 24 hours, the company eliminated that clause from its site in the face of withering criticism from all corners. The site is supposed to let all affected visitors sign up for the Equifax TrustedID Premier credit monitoring service for one year, free of charge. But as of September 10, I was still getting the peculiar response, “Please return here on September 12, 2017, to complete your enrollment in TrustedID.” Entering different data produced different “return” dates, i. e., September 11 or 13. It’s hard to believe there’s anything behind that cloud of smoke, either. Yes, it can get worse! The site was not even registered to Equifax, according to the Whois database, until the afternoon of September 10. Its implementation of TLS encryption is flawed, so connections to it may not be secure. It’s running on the free version of Wordpress blogging software, which is entirely unsuitable for enterprise-grade secure applications. Those are just the highlights; there are so many security flaws in the site that OpenDNS, the Cisco-owned domain name service, blocked access to EquifaxSecurity2017.com and warned it was a potential phishing scam. Indeed, the site looks very much like something a phishing scammer would put together. Check your credit reports from Equifax, Experian, and TransUnion. See my article HOWTO: Get Your Free Credit Report Online for details. Consider placing a credit freeze on your files. Every time I think that Equifax could not possibly have responded to this breach any worse, the company proves me wrong. At this point, I don’t even want to go near Equifax or any site it purportedly owns. I’m just going to order a 55-gallon drum of popcorn via Amazon Prime and watch the rest of this dumpster fire. I'll update this story when (or perhaps IF) Equifax gets their act together and/or releases any more details to the public. Most recent comments on "Equifax Takes The Data Breach Cake"
They want the numeric portion of your address and they do not understand letters in the middle, for example 23w456 or 1n123. Great blog, Bob. I looked into this fiasco last week and found that Equifax owns TrustedID and is using this breach as a marketing opportunity to line up customers for its overpriced, underwhelming credit monitoring service. Avoid at all costs. My husband's two credit cards were affected. The credit card company alerted us to the first one, and are issuing him a new card. They took all the incorrect charges off our account. I caught the other one this morning by checking our other credit card account and seeing two Apple Itunes charges when we don't own any thing made by Apple. He called and they said they would send him a new card for that one because it too had been compromised. Someone had already tried to charge something else, but had the wrong address so it was denied. We will be keeping our eyes and ears open for a while. when ever there is ""BIG MONEY"" involved, there will always be crookedness going on. Does this fall under the Consumer Financial Protection Bureau (CFPB)? The following is from the CFPB site: "If you're having trouble with a financial product or service, you can submit a complaint with the CFPB online or by calling (855) 411-CFPB (2372)." I think of this as possibly Squeaky Wheel, part II. Get ready for a 'CHIP' folks. Based on your own DNA to generate a code unique to your cells. Of course "it won't include GPS tracking" to appease the Christian Population that will refuse the 'MARK of the BEAST'. But even your cell phone has an FM receiver, that isn't allowed by law to be activated....YET! People in this country need to wake up and educate themselves about the Federal Reserve, big banks and credit reporting agencies in this country. They are worse than a sham; they are corrupt and take advantage of the general public's ignorance about money. 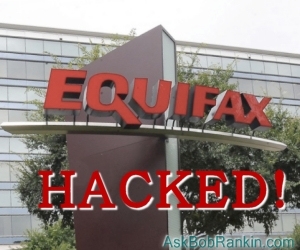 When I read about this latest scandal last week and what to do about it (go to Equifax to make sure your sensitive information is "protected"), I had to laugh. I'll be watching my own backside as much as these miscreants will allow me. They have way, way too much power. Great post, Bob. You expressed my sentiments exactly. I am FURIOUS with Equifax and agree completely with JP's comment, except that I think ALL of Equifax's management should be fired, and that the CEO and Chief Security Officer should also go to jail. I read on Bloomberg (couple days ago) there's already a class action suit filed in Portland, Oregon - and will seek as much as $70 billion in damages nationally. Of course, Equifax didn’t respond to a request for comment on the matter. a) FREEZE: Easy automated (phone or online) lift/restore can be FREE to seniors and/or police-reported identity theft victims (or $10/per bureau per lift/and restore included if desired) varies by State. b) 90-DAY FRAUD ALERT: Can be FREE, and start with Experian to automatically notify Equifax and TransUnion. I can not use credit at Target. I can avoid using Yahoo. I don't have to have a credit card from a hacked company. All after the fact, of course. But how can I possibly avoid Equifax having and giving out my information? Thanks Bob. This makes me feel that people should be able to change their SSNs but according to my lawyer brother whose specialty is Social Security Law that is not possible. Too bad the government isn't more flexible, but, in reality, the federal government has turned into a farce. Follow up on class action lawsuit. My daughter who works in the legal profession told me tonight that 23 lawsuits were filed today against EquiFax. Let the torts begin! Checked my wife's with her current surname and got "we believe your personal information was not impacted ..."
Tried it with her maiden name and got a "we believe that your personal information may have been impacted by this incident"
Be sure you check with all surnames - current and previous associated with your SSN. Thanks to ladylibertea for info on AAA's offering. I've been a member around 40 years and didn't know about it. Just signed up for the ProtectMyId. Yes. Thank you LadyLiberTEA! Signing up for AAA ProtectMyID now. I will be 70 years of age on my next birthday. I figured a couple years ago that I probably will not be seeking any major items requiring loans in my later years. Because of this I put a freeze on my credit reports for all three credit bureaus about three years ago. I check one credit bureau every four months and it has remained clear since I froze my accounts. The freeze has also cut way back on the amount of junk mail I receive. I have a question: If I freeze my credit reports, I understand I canNOT get any new credit. I get that part. But the part I don't understand is can I still get access to my Free (3) credit reports. You know, to see them and check them and make sure they are OK--Each one, once a year. Or are we blocked from doing that too? That part is unclear to me. Great blog Bob. I always enjoy your newsletters. And thanks to folks in advance for any advice you may have. Just froze my wife's account and mine. Don't think only the Christians have to worry about the mark of the beast.